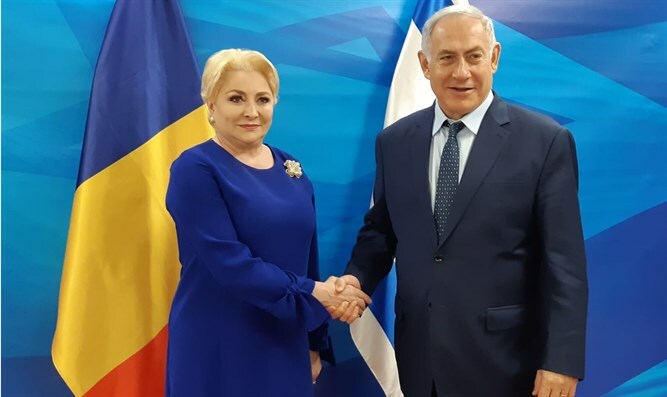 Netanyahu meets Romanian Prime Minister Viorica Dancila, expresses hope that Romania will relocate its embassy in Israel to Jerusalem. Prime Minister Binyamin Netanyahu on Friday met at the Prime Minister's Office in Jerusalem with Romanian Prime Minister Viorica Dancila and expressed hope that Romania will relocate its embassy in Israel to Jerusalem. "This is a wonderful opportunity to see you again. The relations between Israel and Romania are fantastic and they will be made even stronger by our visit,” Netanyahu told the Romanian Prime Minister. “I hope that you will act to stop the bad resolutions against Israel in the EU, and also of course to move your embassy and other embassies to Jerusalem. We wait for you in Jerusalem," he added. Netanyahu and Dancila discussed strengthening bilateral cooperation in various areas. They also discussed Iran's aggression in the region and its efforts to entrench itself militarily in Syria. Netanyahu said that Israel, in its actions against terrorism, is defending not only itself but Europe as well. In April of 2018, the Romanian government approved a plan to transfer the country’s embassy from Tel Aviv to Jerusalem. Dancila later said, however, that the government does not have the support it needs to implement the plan. Romanian President Klaus Iohannis subsequently called for Dancila to resign over the planned embassy relocation, saying he is opposed to the move and was not informed beforehand.